The moment she spins her music, you'll find yourself lured to enter a rabbit hole where the adventures begins! Alison Wonderland is hopping from city to city and mounting her own adventure land — an evening of EDM, electropop, chillwave, and future bass, infused with her classical music roots. 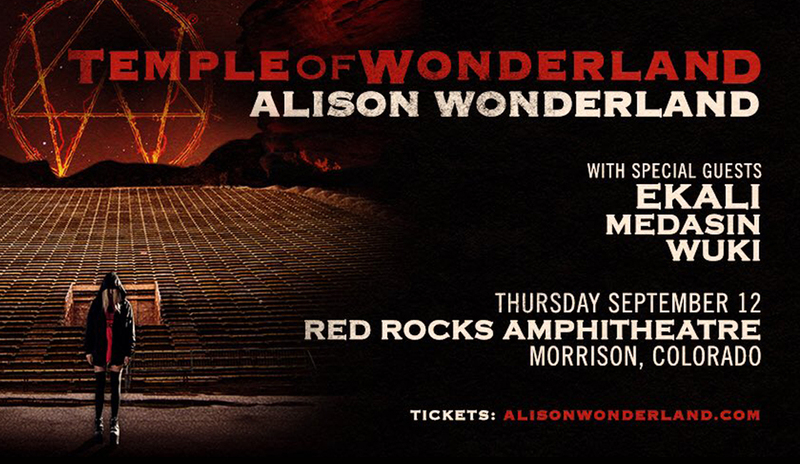 One of her most highly anticipated stops is her performance at the Red Rocks Amphitheater on Thursday 12th September 2019. Alison Wonderland's name is synonymous to a trippy sonic journey. She'll take you to places where your senses haven't been before, she'll stir your spirits to unexplored dimensions, and your body will respond and be set into motion like it's never done before. Experience this wonderland at the Red Rocks. Go, get your tickets now! There is actually a fine line between classical and contemporary electronic music…a classically-trained cellist and an EDM producer and DJ. Others may disagree or may be shaking their heads in wonder how it could be possible. Alison Wonderland is living and breathing proof that a cellist like her could spin some electrifying sounds. Alexandra Sholler was trained as a classical musician, specializing in cello. How she became Alison Wonderland was quite a unique occurrence. "I went out to a club called Candy's Apartment… Someone played 'Silent Shout' by the Knife… I remember just completely zoning out… and walking over to the DJ and asking, 'What is this track?! Please tell someone what this track is, because this is amazing'," narrates Alexandra. From there, the transition to producer and DJ started taking shape. In March 20, 2015 Alison released her debut album, "Run" which peaked at No. 6 on the ARIA Albums Chart and was certified gold by ARIA. Social media also took a big part in cultivating her following. She has more than 130,000 followers on Soundcloud and her song are said to have reached more than a million streams. With her second album, she proved she's not a flash-in-the-pan act. Her second album "Awake", debuted at No. 1 on Billboard's Top Dance/Electronic Albums. She made it to the list of DJ Mag's Top 100 DJs in October 2018 at number 96. She is also the highest billed female DJ in Coachella history. Alison Wonderland's credentials and achievements alone are reasons enough for you to trip the light fantastic and bask in this sonic wonderland. Book your tickets now!